Heat oven to 375°F. Spray 8-inch square (2-quart) glass baking dish with cooking spray. Separate dough into 10 biscuits. Cut each into quarters; place in medium bowl. Stir in 1 cup pizza sauce to coat. Spoon biscuit mixture evenly into dish. Bake 15 to 20 minutes or until light golden brown and center biscuits are no longer doughy. 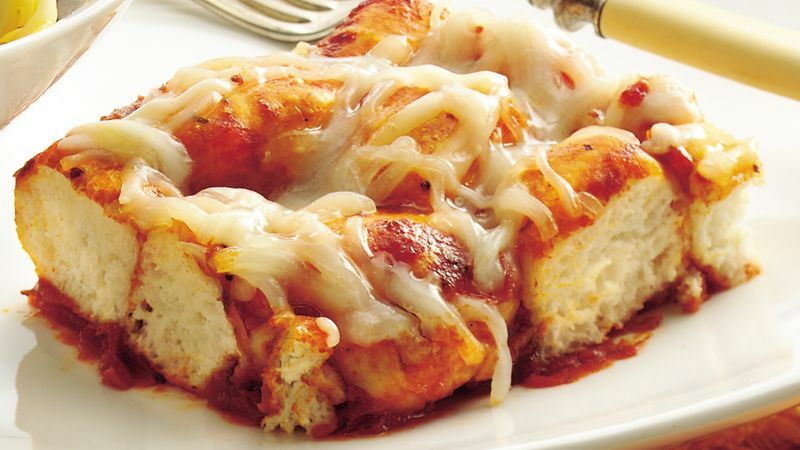 Sprinkle with cheese; bake 5 minutes longer or until cheese is melted. Cut into squares; serve warm with additional pizza sauce for dipping. To easily cut the biscuits into quarters, use a kitchen scissors.